Seniors Ryan Almaleh and Eric Antes led Hyman Brand Hebrew Academy of Overland Park, KS, to victory at the 13th Annual Red Sarachek Basketball Tournament of Yeshiva University, as the Rams defeated top-seeded and previously unbeaten Marsha Stern Talmudical Academy/Yeshiva University High School for Boys (TMSTA), 50-34, in the championship game March 22. 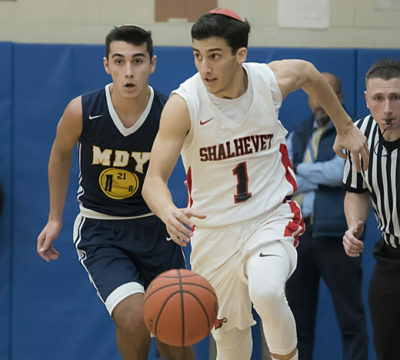 In one of the most thrilling games of the Red Sarachek Tournament so far, the Ramaz Rams (1-1 Red Sarachek) defeated the Valley Torah Wolfpack (1-2 Red Sarachek) 39-37 in come-from-behind fashion. On a day that promises to be big, the Yeshivat Rambam of Baltimore Red Storm got things going with a bang. In yet another exciting finish at the Max Stern Athletic Center, Yavneh held off the lower seeded Lions of Eshkol. Yeshiva of Boca Raton (1-1 Sarachek) scored the first 17 points of the first game of Saturday night. And although Beren of Houston (0-3 Sarachek) was able to play them to a near stalemate the rest of the way, the outcome was never in doubt as the Storm defeated the Stars, 50-32. This is what Sarachek is all about.